As we go about our daily lives, many of us are somewhat aware that our bodily systems are functioning 24 hours a day. Our brains are like our own personal COO’s, directing and overseeing all of our bodily processes. Our immune systems are battling to maintain our health, as our digestive systems are busily processing nutrients. Our lungs are expanding and our hearts are beating as blood and oxygen are pumped throughout our bodies, delivering vital nutrients to our cells and organs. When our bodies are healthy, they operate without us having to give it much thought beyond eating well and exercising. How many of us realize that a healthy liver is also of major importance to everyday wellness? As our largest glandular organ, the liver performs over 500 essential functions relating to digestion, metabolism, immunity, detoxification and nutrient storage. Among other tasks, the liver must process virtually everything we eat or drink, breathe in or put on our bodies. We ask a lot of this approximately 3 pound gland, especially when we smoke, eat unhealthy foods, consume too much alcohol, expose ourselves to toxins, or misuse prescription and non-prescription medications. What exactly are some of the liver’s crucial functions? Digestion – The liver forms and secretes bile which aids in the digestion and absorption of fats and fat soluble vitamins such as A, D, E and K.
Metabolism – The liver metabolizes carbohydrates, fats, and proteins into their biologically available forms. Fatty acids and amino acids are metabolized to produce energy in the form of ATP. Glucose from digested food is stored in the liver as glycogen, which is used as fuel and released to maintain homeostasis and regulate blood sugar levels. Detoxification – The liver cleanses the blood by metabolizing alcohol, drugs, pesticides, food additives and chemicals, and neutralizing or destroying toxins. Hormone regulation – The liver is responsible for maintaining balanced thyroid, reproductive and adrenal hormones among others. Nutrient storage – In addition to glycogen, the liver stores essential nutrients, vitamins, and minerals. Production – The liver produces vital protein components involved in the formation of blood clots. The liver also regulates and produces cholesterol, which it excretes and converts into other essential substances. Immunity – Liver cells capture and digest bacteria, fungi, parasites, worn out red blood cells and cellular debris. As blood passes through the liver, large volumes of blood are quickly cleansed. You can help to keep your liver strong and healthy by maintaining a healthy weight, providing high quality nutrients and reducing your toxic load. Dietary intake places the largest potential burden on the liver. Avoid high calorie fried foods, fast foods and processed foods, which are high in fructose and trans-fats and are known to contribute to obesity and the increased risk of developing non-alcoholic fatty liver disease. Support your liver by eating sulfur-rich veggies such as onions, garlic and cruciferous vegetables, which are high in fiber and naturally detoxifying. Eating organically raised and grown foods free of pesticides, antibiotics, growth hormones or chemical additives reduces the toxic burden on the liver. Spice up your meals with turmeric and cinnamon, which are known to support healthy liver function. Use alcohol responsibly or not at all. Excessive consumption of alcohol on a regular basis or binge drinking forces the liver to continuously work overtime. This type of abuse can damage or destroy liver cells and lead to alcoholic fatty liver disease, inflammation, or cirrhosis, a scarring of the liver tissue. As the liver is the clearinghouse for drugs and medications, carefully follow directions on both prescription and OTC medications, some of which can affect or harm the liver. Mixing medications with alcohol can have dire consequences, such as liver failure. By wearing a mask and gloves, you can limit contact with aerosol sprays, chemicals, insecticides and toxins, such as those found in cleaning products. As exposure to chemicals, additives, and synthetics can negatively affect the liver, consider switching to natural body and personal care products when possible. Do not smoke. Smoking negatively affects the liver’s ability to process and remove toxins. According to the American Lung Association, cigarette smoke contains thousands of harmful chemicals including lead, formaldehyde, toluene and arsenic, all of which must be processed by the liver. Plus, smoking is a known high risk factor for liver cancer. Exercise is particularly important for healthy liver function. 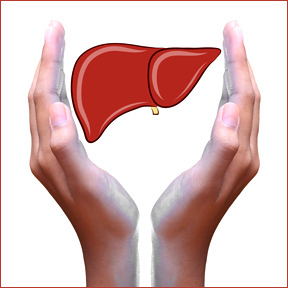 A strong liver is better able to defend against viruses, disease and pollutants. Frequent exercise helps to maintain a proper weight, reducing the risk of non- alcoholic fatty liver disease. Participation in an occasional detoxification program, which enhances the body’s natural elimination system, supports liver, kidney, bowel and lymphatic system health. Consider high quality supplements that protect and support liver health. Antioxidants such as silymarin, curcumin and alpha lipoic acid (ALA) support the liver’s detoxification pathways and promote liver health and function. Lipotrepein (SF700) by Thorne Research – This time-tested lipotropic formula contains nutrients and botanicals for liver support. Lipotropic substances can improve and maintain lipid metabolism in the liver and prevent accumulation of fat. Metabolic Rejuvenation (65901) by Douglas Laboratories – This comprehensive 28 day, 3 phase detoxification support program contains nutrients specifically chosen to support phase 1 and phase 2 liver detoxification. This complete program is designed to prepare, detoxify and repair the body and the intestinal tract. Detoxification Factors (Tyler) by Integrative Therapeutics – This product provides comprehensive nutritional support for healthy detoxification processes in the liver. Naturally sourced antioxidants, such as quercetin and milk thistle (silymarin), stimulate healthy liver cell development. 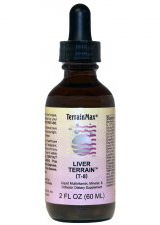 Liver Terrain™ (T-8) by Apex Energetics – This unique liquid formula contains multivitamins, minerals and co-factors, which support liver health and address liver meridian imbalances.